November 8, 2010 - The outcome of the Arizona "papers please" law will be decided by a three-judge panel of the 9th U.S. Circuit Court of Appeals. They will weigh the legality of Arizona's immigration law, SB 1070. The three judges will decide Arizona's appeal of a lower-court ruling that blocked the most-controversial sections of the law from being applied. The Arizona law (SB 1070) allows state officials to inquire into the immigration status of any person based upon "reasonable suspicion": For any lawful contact made by a law enforcement official or agency of this state or a county, city, town or other political subdivision of this state where reasonable suspicion exists that the person is an alien who is unlawfully present in the United States, a reasonable attempt shall be made, when practicable, to determine the immigration status of the person. Racial Profiling – The state and county enforcement officers are to use the “reasonable suspicion” standard when coming into lawful contact with any individual, not just illegal alien. It could even be an American citizen.. This should mean that the officer must have to have some reason, outside of race alone, to request documentation from the individual who is stopped, questioned, detained, arrested, etc. Governor Brewer recently toned down the “any awful contact” however, officers may stop and ask for documents from everyone in a van or car that is blocking or impeding the flow of traffic. This is a very low level of inquiry, which can basically stop a major portion of drivers. Doctrine of preemption – Whether the Arizona law usurps the power of the Federal Government to be the sole arbiter of immigration laws. Doctrine or Preemption - Since the federal government did not do anything about the immigration problem they are in essence relegating the responsibility to the individual states as permitted by the 10th Amendment of the Constitution. SB 1070 would expose the fact that the Federal Administration has completely abandoned its duty to secure the border and enforce our immigration laws, ultimately forcing Arizona to enact the law. Senator Jim Inhofe (R-Okla.) described the law a reaction to the federal government's inaction, "I think the frustration is that the federal government isn't enforcing the laws, so we're going to do it on the state level." (The Hill, April 26, 2010). Senator John McCain (R-Ariz.) said that his state had to pass a tough immigration law because Obama has failed to "secure our borders." (The Associated Press, April 27, 2010). He added that the situation in his state is "the worst I've ever seen." Proponents of the law have repeatedly referred to the killing of two Phoenix police officers by illegal immigrants in 2007, or the recent killing of a cattle rancher near the Mexican border by a drug smuggler. State Rep. John Kavanagh, a co-sponsor of the law, said of illegal immigrants, "They bring a lot of crime with them." Phoenix Police Chief Jack Harris told reporters that some 10% of his arrests are illegal immigrants — a number near the estimated percentage of undocumented immigrants in the local population. The Maricopa County sheriff's office, which runs the jail for Phoenix and surrounding cities, said 20% of its inmates are illegal immigrants. Fifteen percent of state prisoners are illegal immigrants. The bill's proponents contend that criminals in Mexico are increasingly heading north through Arizona. "A large portion of [illegal immigrants] are coming here seeking a life and, quite frankly, fleeing the violence in Mexico," said Brian Livingston, executive director of the Arizona Police Assn., who added he was persuaded to back SB 1070 by calls from a Latina complaining that no one arrested illegal immigrant gang members in her neighborhood. "Amongst those people are criminal elements who prey on those people," he said. In an unusual step the Justice Department sued Arizona in an attempt to overturn the law and successfully put on hold sections that would allow for warrantless arrests of suspected illegal immigrants and criminalization of immigrants for failure to carry their immigration papers. In July 2010, U.S. District Court Judge Susan Bolton struck down key provisions of SB1070 before it took affect, thereby agreeing with the federal government's argument that immigration enforcement is the duty of the federal government. Arizona had argued that these portions of the law were necessary to fight a growing avalanche of illegal aliens entered though the Mexican border. Civil rights groups and federal lawyers however, objected. If the three-judge panel rules in favor of the federal government, the state could apply to the full 9th Circuit hear its appeal. The case would then go directly to the U.S. Supreme Court. It is difficult to guess how each of the three appellate judges will rule. All three judges are experienced on pre-emption appeals. Judge Noonan, appointed by President Reagan, is labeled conservative. Judge Paez, appointed by President Clinton - is labeled a liberal. Judge Bea, a conservative appointed by President Bush is a former immigrant who nearly got deported. Bea and Paez are of Hispanic descent, and it is Hispanics who are most disappointed with the Arizona law. Comments from the judges imply that they may uphold a major part of the injunction against two provisions of SB 1070: one that criminalizes non-citizens’ failure to register with the federal government or carry immigration documents, and another that criminalizes undocumented immigrants’ attempts at finding or engaging in work. The Justice Department maintains that the provisions make criminal, under Arizona law, activities that are subject only to civil penalties under federal law. When these provisions were brought up, Bea and John Noonan, a Reagan appointee directed the attorney to move forward, indicating they should uphold the injunction against these sections of the law. The panel of judges seemed willing to permit police to check for legal status if they suspect illegal status but did not go as far as to permit authorities to arrest and prosecute such suspects under state law. If this were the ruling it allow suspected illegal aliens to be turned over to Homeland Security for deportation. The judges seemed to concur with a lower court's ruling that the Arizona law in fact, interfered with the federal government's authority regarding illegal immigration. However to the dismay of civil activists and the Justice Department, the judges seemed ready to lift the ban on the police to demand immigration paperwork and then to turn them over to Homeland Security for deportation. Arizona Gov. Jan Brewer, who appeared at the hearing in San Francisco, said that she will appeal the case all the way to the U.S. Supreme Court if necessary. Proponents of comprehensive immigration laws fear that this decsion could set a new negative tone on immigration politics. October 31, 2010 - It’s finally official. Dilma Rousoff has been elected as the first female president of Brazil. She thrashed José Serra of the opposition centrist PSDB in a second-round run-off today, Sunday, winning 56 per cent of the vote. Dilma, who has never had any elected political office was a long time government bureaucrat and was President Lula’s chief of staff and energy minister. Many analysts concur that it wasn't Workers' Party candidate Dilma’s speech-making ability, her proposals or record that provided her with victory. What made the difference was the support from her mentor and predecessor President Luiz Inácio Lula da Silva, who has an amazing approval rating of more than 80 per cent. He made it his main concern during his last year in office to get Dilma elected. Lula had dedicated much of the last several weeks campaigning for Dilma, who served him as chief of staff and energy minister. At his 65th birthday celebration Wednesday, he asked voters to give him Dilma's victory as a present. The opposition did better in this year’s election for state and federal assemblies and for the post of state governors. And although Serra’s campaign lost, the opposition remained unified. Now that Serra’s presidential aspirations are gone, Aécio Neves, the young and charming governor of Minas Gerais state, is ready to come forward. Luckily for Dilma, she will enter office on the peak of the strongest economic progress in two decades, the nation's lowest unemployment rate on record and an even stronger congressional popularity than Lula had. Dilma Rousseff, 62, is the daughter of a schoolteacher mother and a Bulgarian immigrant father. During her period as a college student, Dilma joined an urban guerrilla group called National Liberation Command to oppose the military dictatorship that ruled Brazil from 1964 to 1985. To many she is consider a patriot and a hero because of the torture she endured during the early 70’s when she was jailed for her political activism. Washington D.C. - Today, the Pew Hispanic Center released a report that has an attention-getting headline, but pays little attention to detail. The report makes much of recent data indicating that unemployment has fallen slightly among foreign-born workers over the past year, while rising slightly among native-born workers. Some observers will undoubtedly conclude from this that the jobs which went to foreign-born workers would have otherwise gone to native-born workers if not for the presence of immigrants in the labor market. However, this is not the case. In reality, immigrant and native-born workers are not interchangeable, nor do they compete with each other for some fixed number of jobs in the U.S. economy. Moreover, many immigrants are highly skilled professionals who create jobs through their inventiveness and entrepreneurship. Unfortunately, the Pew report provides no detail about the skill level of the workers who have gained or lost jobs since last year, nor does it tell us where in the country they live. Yet this is critical information in determining how many unemployed natives might have filled jobs which went to immigrants. As the Immigration Policy Center (IPC) pointed out in an August 2009 report, employed immigrants and unemployed natives "tend to have different levels of education, to live in different parts of the country, to have experience in different occupations, and to have different amounts of work experience. As a result, they could not simply be 'swapped' for one another." Consider just the question of where native-born and foreign-born workers live. According to a July 2010 report from the Congressional Budget Office, 62.5% of foreign-born workers lived in six states as of 2009: California, New York, Florida, Texas, New Jersey, and Illinois. In contrast, 66.2 percent of native-born workers lived in the other 44 states. In other words, many unemployed natives would have to travel half way across the country to reach the jobs currently held by immigrants. In addition, as the Pew report itself notes "even if immigrants have managed to gain jobs in the recovery, they have experienced a sharp decline in earnings. From 2009 to 2010, the median weekly earnings of foreign-born workers decreased 4.5%, compared with a loss of less than one percent for native-born workers. Latino immigrants experienced the largest drop in wages of all." It's also important to remember that even if immigrants were somehow magically removed from the U.S. labor force, this would not "free up" jobs for unemployed natives. Why? Because all workers are also consumers who create jobs through their purchasing power. If all immigrant consumers in the United States disappeared, many businesses that depend heavily upon their purchases would go under and the U.S. economy would lose jobs overall. When examining the latest figures from the Pew Hispanic Center, it is important to keep in mind that most foreign-born workers complement, rather than compete with, most native-born workers. As an August 2010 report from the Federal Reserve Bank of San Francisco points out, "immigrants expand the U.S. economy's productive capacity, stimulate investment, and promote specialization that in the long run boosts productivity," and "there is no evidence that these effects take place at the expense of jobs for workers born in the United States." For more information, contact Wendy Sefsaf at wsefsaf@immcouncil.org or 202-507-7524. Washington D.C. - Earlier this week, the American Immigration Council's Legal Action Center (LAC), the American Immigration Lawyers Association, and the Pennsylvania Immigration Resource Center filed an amicus brief with the Board of Immigration Appeals (BIA) urging the government to protect the rights of immigrants whose mental disabilities prevent them from participating meaningfully in their own removal hearings. Nearly one in six individuals in immigration custody have some form of mental illness, and there have been reports of mistaken deportations of U.S. citizens with mental disabilities. "This is particularly disturbing given that these immigrants are not granted court-appointed counsel in immigration proceedings" said Melissa Crow, Director of the Legal Action Center. The BIA is currently considering a case involving a noncitizen with mental disabilities and sought input from the LAC on a range of questions relating to procedures for adjudicating this and similar cases. The LAC urged that a single case, which does not raise fully all the issues that need to be resolved, is not the proper forum for deciding such complicated issues with far-reaching implications. Instead, the LAC argued that a rulemaking process, with outreach to a broad spectrum of stakeholders, including disability rights advocates, mental health professionals and social service providers, would be a more appropriate way to proceed. In his second year in office, Obama has finally seen the light and is telling lawmakers that he's ready to move forward to help pass a bill allowing thousands and perhaps millions of students who either attends college or join the military to become legal residents. Speaking at a meeting of the Congressional Hispanic Caucus Wednesday Obama said that he'll work with the Senate and support Democratic leader Harry Reid of Nevada in trying to get the DREAM Act passed. Senate Majority Leader Harry Reid, the brave and eternal immigration advocate, has said he will attach the bill to a defense policy measure the Senate may consider next week. Republicans are against handling the bills that way and have accused Reid of playing politics with the measures. Reid is taking a great risk in this position, as he is presently fighting for his seat as senator of Nevada, a state with a tremendous anti-immigrant momentum. "We have a serious amnesty threat with the DREAM Act giving citizenship to over 2.1 million illegal students and young adults," the call to action read. More than three million students graduate from U.S. high schools every year and each year 70,000 of these graduates are undocumented students with basically no hope of pursuing their dreams to be a legitimate part of American society. These young people unfortunately, begin their life "behind the 8 ball." They do not get the opportunities most kids have as an inherent part of being a U.S. citizen. Attached to them is the notorious title of, an illegal immigrant. Most of these youths have lived in the United States for a majority of their lives and, now upon graduation from High School, they find that they cannot go to college, get decent work or even drive a car. They live in fear that their status will be discovered and they will be deported. In essence they are relegated to a sub-class, similar to the untouchables in India's past. Those living in Arizona must, by now be in a panic state. Illegal students can only obtain permanent status through their parents; there is no independent method to accomplish legal residency for them. And if the parents are illegal, they have absolutely no way to "stand in line" and wait for legal documentation, as repeatedly and incorrectly suggested by those anti-immigration reform proponents . If they return to their country of birth, it would not guarantee a path to documented status. On the contrary, they probably could never be able to legally return. Even so, these children are innocent and not to blame. They came along with their parents, most of them between 2 to 10 years of age. These children studied in the U.S., made American friends, and evolved into Americans. Some did not even have the knowledge about their legal status until they attempted to enter college and found out the hard way that they are illegal and have no future in the U.S. To the rescue comes the Dream Act. During an interview last week with the Spanish-language newspaper La Opinion, Reid was quoted as saying, “I just don’t want anybody to think that if we somehow just do the DREAM Act, that that solves the problem. We’ve got a bigger problem that we have to solve. We still need comprehensive immigration reform. Time is short; November is around the corner and the lives of millions of children are at stake. Is President Obama Secretly Planning Immigration Reform Without Congressional Approval? Perhaps President Obama does have what it takes to help the millions of undocumented immigrants and their children waiting anxiously on the side liens for comprehensive immigration reform. Apparently in an undated, internal draft memo by U.S. Citizenship and Immigration Services uncovered Thursday details "administrative relief options to… reduce the threat of removal for certain individuals present in the United States without authorization." The memo reads "In the absence of comprehensive immigration reform USCIS can extend benefits and/or protections to many individuals and groups by issuing new guidance and regulations." It further describes the probable steps the agency could take to resolve the country's estimated 12 million unauthorized immigrants. This may include awarding some groups conditional legal residency. These ideas were discussed in a draft memo prepared for Alejandro N. Mayorkas, director of the federal agency that handles immigration benefits, This Thursday the unexpected document was made public by Sen. Chuck Grassley, R-Iowa, who along with six other senators wrote to Obama over a month ago, They asked for his promise that some type of help was in the works for the millions of illegal immigrants. "The administration has failed to reassure us that the information we were hearing was inaccurate," Grassley said in a statement to ProPublica Thursday night. "This memo gives credence to our concerns that the administration will go to great lengths to circumvent Congress and unilaterally execute a back door amnesty plan." A controversial portion of the memo involves the use of "deferred action," The power of deffered action lies in the fact that at the agency's discretion it can indefinitely delay the deportation of otherwise deportable non-citizens. "This would permit individuals for whom relief may become available in the future to live and work in the U.S. without fear of removal," the memo said. The memo clealy discussed that granting deferred action to an unrestricted number of people "would likely be controversial, not to mention expensive." As an alternative, it recommends that this alternative be used for specific groups, such as the many thousands of young people who would be allowed to stay in the country if Congress passed the Dream Act. That bill would grant a path to citizenship for qualifying young people who complete a college degree or two years of military service and entered the United States before the age of 16. The memo would reverse the position currently held by the agency's Office of General Counsel under previous administrations, The memo recommends granting green cards to people currently in the country under Temporary Protected Status. That status usually granted to people of certain countries that have suffered major calamity, such as earthquake, hurricane and civil war. Supporters of comprehensive immigration reform awill certainly be elated should such action by the administration come to pass. ((It will further vidicate, Obama’s commitment to the immigrant community)). As expected, Republican senators are in a panic and have written to immigration officials in the Obama administration asking them to disclose whether large-scale plans are truly under way to provide what they call a non-legislative version of amnesty. In an effort to collect more than $2 billion in unpaid child support payments, Indiana lawmakers passed a bill to hold back casino winnings from those who pay no attention to their court-ordered obligations. The Indiana Department of Child Services estimates more than 165,000 “deadbeat parents” each are indebted more than $2,000 in support payments. Colorado passed a parallel law in July 2008, resulting in more than $320 million in delinquent payments. Other states are following suit. Every child, no matter, whether they are legal in this country or not, has the right of support from both parents. Many times, as a result of disputes between the parents, the child comes out the looser. In New York, the New York State Child Support Services, a not for profit agency, provides free assistance to parents in many ways. They can help you find an absent parent, establish legal fatherhood of a child, get a support order from the court for a child, including medical support, enforce unpaid child support, collect child support payments from a parent, review and change your support order for more support and even help you if your spouse is in another state. And best of all, to be eligible for these services you only have to be the custodial parent or guardian of the child. Everything is free. Once you apply the following services are provided: Computer searches are used to find the parent, orders are taken for blood tests to prove paternity, support orders are obtained from the court for collection of support, arrears, and medical coverage to be automatically deducted from the paying parent s job. Every three years, the Support Collection Unit, can review your support order to make sure it is the correct amount allowed by law. If you need this type of assistance go to your nearest Child Support Enforcement office. Be prepared to provide as much information about the absent parent as possible. The more information you provide, the faster you will receive support. You should have in your possession, the full name of the parent, current or last known address and phone number, current and last known work address and phone numbers, social security number (look at old pay stubs, tax records, military or medical records), income information (tax records, pay stubs, bank records), the child s birth certificate, marriage license, if applicable, divorce papers, any prior child support orders, a list of all your child related and personal expense, per month. What is the amount you will receive in child support. Well, that depends largely on the non-custodial parents income and the state you reside. For example in New York, the general rule is that he will have to pay 17% of his salary if there is one child, 25% if there are two children, 29% for three children, 31% for four children and no less that 35% if there are more than five children. In additional there will also be an additional amount for medical coverage and baby-sitting expenses, when the custodial parent works. If an order for support is entered and the non-custodial parent fails to pay, the agency will help you get and order from a judge that will take the support payments directly out of his or her pay. And don t worry if he lives in another state. An inter state order can be entered. The court will then send the order to the state that your spouse lives. They will contact him, obtain a lawyer to represent you at no charge, and proceed to collect the child support for you. For more information on locating the Family Court located in the county you live in go to the Administration for Children and Families (ACF) site. Most importantly don’t give up if you are not receiving child support form the non-custodial parent. You must collect the child support, not for yourself, but for your child. The money belongs to him. In the midst of endless calamities, oils spills, economic doom and unemployment, when all hope seems to have been dissipated, President Obama today, will make a renewed effort for comprehensive immigration reform and keep the promise he made as a candidate to make it a priority in his first year. Perhaps it’s just in time, when following November’s election, there will be a lame duck session where anything is possible. This Tuesday Obama met with members of the Congressional Hispanic Caucus in the State Dining Room of the White House and talked about an approach for passing a bill that had seemed lifeless all this year. Rep. Luis V. Gutierrez (D-IL-4), the chief proponent of comprehensive immigration reform was an integral part of that meeting. Today, the president will explain to the American public why he believes a comprehensive approach is the only way to fix a broken immigration system. In a speech at American University in Washington DC , he expects to make the case for creating a path to legal status for the estimated 12 million illegal immigrants who live in the U.S. while simultaneously strengthening border enforcement. Obama has stated that a comprehensive solution implies "accountability for everybody.” This would include the U.S. government in securing the border, to enforcing “employer sanctions” for knowingly employing illegal immigrants and requiring that to those who enter the country illegally admit their actions before they can begin the long process of becoming citizens. White House officials said that recent developments on immigration influenced his decision to give a speech, most particularly Arizona's endorsement of a tough anti-immigrant law and the numerous and growing protests across the American landscape. Mayor Michael Bloomberg of New York, will be among invited guests. He has been a supporter in the fight to revise federal immigration statutes. Bloomberg will also be launching a coalition of mayors and business leaders to advocate for a revamp of the nation's immigration policy, including legalizing undocumented immigrants and less tolerance to businesses that hire illegal workers. The mayor has been increasingly verbal in what he has repeatedly describes as a broken immigration system. “Our immigration policy is national suicide,” he said last week when he announced the formation of the coalition of pro immigration mayors and business leaders. No matter how you look at it, the outlooks for getting a bill to Obama’s desk before lawmakers start their November campaign looks bleak. The political reality is that Obama needs Republican support in order to get the bill moving in the right direction. His most notable obstacle is the Senate, where Democrats do not have the 60 votes needed to overcome GOP filibuster strategy. "I've got to have some support from Republicans," he said at a May news conference during a visit with Mexican President Felipe Calderon. Obama approved a proposal by Sens. Chuck Schumer, D-N.Y., and Lindsey Graham, R-S.C., which would require illegal immigrants, among other things to pay fines and back taxes and perform community service to ultimately obtain legal status. But Graham has since has backed away and no other Senate Republican has succeeded him. Republican support has been fleeting. In the House, a parallel bill championed by Rep. Gutierrez called the Comprehensive Immigration Reform for America's Security and Prosperity Act (CIR-ASAP/H.R. 4321) is ready for prime time. The bill, is sponsored by Rep. Solomon Ortiz (D-TX) and co-sponsored primarily by members of the Congressional Black Caucus, Congressional Asian Pacific American Caucus, Progressive Caucus, and Congressional Hispanic Caucus. Most Republicans insist on measures to tighten security along the U.S.-Mexico border before they consider comprehensive immigration reform, but Obama is in disagreement with that approach. Since he took office, his administration worked diligently to improve border security, including increasing personnel and equipment along the border. Obama recently directed 1,200 National Guard troops to the border to increase security and requested Congress for an additional $600 million to use in support personnel and improve technology. Time seems to be ripe for a major overhaul in the U.S. immigration laws. Today millions of people including illegal immigrants, legal residents, American citizens and U.S. businesses are being held in a type of limbo because of a law that is so convoluted and draconian that it cries out to be changed. Obama responds to Arizona Gov Brewer�s within 2 weeks as promised � We will Sue You! Just two weeks ago President Obama in a meeting with Gov. Brewer promised her that he would get back to her (or his staff would) within 2 weeks of their White House Oval Office meeting to discuss Arizona's immigration law SB 1070. To Brewers surprise and consternation , Obama responded through Secretary of State Hillary Clinton. Clinton appeared in an Ecuadorian TV show and said: "He [Obama] thinks the federal government should be determining immigration policy and the Justice Department under his direction will be bringing a lawsuit against the act.” She further went on to say, that what is more important is President Obama's commitment to passing comprehensive immigration reform. That is what is needed. 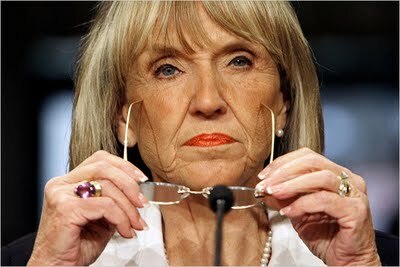 Governor Jan Brewer quickly reacted when she heard about the potential lawsuit by saying: "This is no way to treat the people of Arizona. To learn of this lawsuit through an Ecuadorean interview with the Secretary of State is just outrageous. If our own government intends to sue our state to prevent illegal immigration enforcement. The least it can do is inform us before it informs the citizens of another nation," said Brewer. Brewer also threatened the administration: “It's outrageous! It's just -- it's just bizarre! It's just bizarre! But I will tell you... we are not going to back away from this issue. We are going to pursue it. We're going to be very aggressive. And we'll meet them in court! We will meet them in court. And we will win. I truly believe that we will win. And the population of America, again, agrees with Arizona..
Gov. Brewer's response is endemic of the problem our country is facing today. With a growing number of right wing extremist, including white supremacist and neo-Nazi’s, many arising out of Arizona coupled with the Tea Baggers support by Fox news and other right wing entities, America is becoming a nation on the verge division. In almost a Déjà vu of the civil war, when brothers were fighting against brothers; one side fighting for civil justice and freedom from slavery while the other side wanting to continue their laconic life pampered by their slaves who lived in misery. The Confederate States seceded from the Union because they could not put up with a powerful central government controlling the actions of independent states. A similar problem is growing in the U.S. Right wing fanatics, touting guns and hinting at overthrow of the government. Tea Baggers, organized by republican media moguls, and libertarians wanting to strip away civil rights that were so hard to obtain. Dissatisfaction is familiar to all democracies. But in 2010 we are are seeing is a hostility and aggression way beyond a highly-spirited debate. Three dangerous movements foreshadows critical perils for immigrants and America itself: the rapid rise of the militia hate groups, the emergence of a fanatical political group called “The Tea Party working together with Libertarians,” and a call to action fueled by Talk Radio hosts such as Glenn Beck and Rush Limbaugh provides ample support for white supremacist and anti-immigrant hate groups such as the Immigration Reform Law Institute which is the legal arm of the chameleon organization named Federation for American Immigration Reform, or FAIR. As Rachel Maddow revealed in a recent program, the founder of FAIR is a well-known racist. The seed money he used to start FAIR came from an infamous Eugenics (the same thing the Nazi’s did outfit. Tanton developed many different entities so that it appears that there are numerous advocates for what he sees and the ideal society. Another of his group, the Center for Immigration Studies, acts as so-called "think tank" to the anti-immigrant movement. Some other entities he is invalid with are the Coalition for the Future American Worker, Progressives for Immigration Reform, NumbersUSA, Immigration Reform Law Institute, United to Secure America Coalition. These are just a few of his many groups that work in unison trying in earnest to modify America's thinking on immigration. Hate groups are not new a new development. Since the 1880’s the KKK has been considered a founding father of the modern hate groups and they still exist. What has changed lately is the speed in which these hate groups have grown since Barack Obama took office. Today there is a coordinated and concerted effort with various people such as Sara Palin, Glenn Beck, and Rand Paul vying for supreme leadership of this anti-government movement. But no matter how hard they try; no matter what lies they make up, they will never succeed in keeping America lily white and christian as projected population trends indicates that whites are expected to become a minority in the United States by 2050. This fact is an unacceptable reality to these anti-American radical right-wingers, and it has sent them into sheer panic. Arizona Wants to Deport American Children. Oh my God! The Arizona Congress is at it again. In what appears as a blunderbuss approach to anti-immigrant legislation, they have now decided to target U.S. citizen children; which they call “anchor babies.” These children have at times been useful weapons in keeping their illegal parents from being deported. If the Arizona Republicans get their way, any child born in the U.S, to illegal immigrants would not automatically be an American Citizen. In fact they would most probably be deportable. If you had to guess, which State Senator proposed this bill, you would be 100% correct when you name Senator Russell Pierce as the prime proponent of the bill. Remember him; the infamous force behind Senate Bill 1070, the “papers please” law, which obliges police officers to ask about someone’s immigration status during any traffic stop or with reasonable suspicion that the person is not a legal alien. While SB1070 requires adult immigrants to have documentation of legal residency, the “anchor baby” bill will prevent the next generation from ever being able to become legal in the U.S. According to a Time.com article the plan is to make the process of obtaining citizenship so difficult that illegal immigrants will take “the anchor” and leave. ((Arizona will have a slippery slope to conquer if this law is passed as it is diametrically opposed to our Constitution)). The 14th Amendment of the Constitution grants citizenship to ""All persons born or naturalized in the United States, and subject to the jurisdiction thereof, are citizens of the United States and of the State wherein they reside. No State shall make or enforce any law which shall abridge the privileges or immunities of citizens of the United States." The purpose of the amendment was to provide citizenship for freed slaves and served as a final clarification of the Dred Scott case. In essence it reinforced the federal government's jurisdiction over citizenship. Pierce says the 14th Amendment has been "hijacked" by illegal immigrants….” This is an orchestrated effort by them to come here and have children to gain access to the great welfare state we've created." Pearce tells reporters that he is aware of the constitutional issues raised by the bill and promises to “…write it right." He points to prevalent sympathy for the law. Some 58% of Americans polled by Rasmussen believe children of illegal immigrants born in the U.S. should not automatically be considered an American Citizen. Interesting that 76% of Republicans believe the same. Ariz. Gov. Jan Brewer, a Republican would most like support this bill. Recently she said in an interview with ABC Tucson "[i]t is illegal to trespass into our country….The bill won't tear families apart. They can take their children back with them." Critics of the bill that Republican state Sen. Russell Pearce’s bill would fly in the face of the 14th Amendment to the Constitution, which grants citizenship to anyone born in the U.S. Many opposing the bill believe that it would lead to more prejudice and segregate the community. Phoenix resident and U.S. citizen Susan Vie is heading a citizen group that’s supporting an opposing ballot initiative. An Argentinean who moved to the U.S. more than 30 years ago she has taken a stance against what many consider one of the most draconian immigration law in our country’s history. "I see a lot of hate and racism behind it," Vie says. "Consequently, I believe it will create — and it's creating it now — a separation in our society." She adds, "When people look at me, they will think, 'Is she legal or illegal?' I can already feel it right now." Vie's proposal would forbid SB1070 from taking effect and place a three-year moratorium on all related laws, including the anchor-baby bill, with the ultimate goal f comprehensive immigration reform.She and the members of her group is racing to accumulate 153,365 signatures by July 1 to be eligible for the Nov. 2 general election. It is expect the anchor-baby bill, if made into law, will eventually to end up in the U.S. Supreme Court and struck down, before it can go into effect. Prior attempts to get around the citizenship provisions in the amendment, going back to the late 19th century challenging the citizenship of the children of Chinese immigrants, have been unsuccessful.